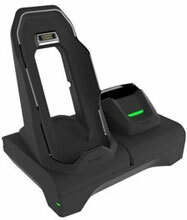 Motorola - TC70 2-SLOT Charge/USB/Ethernet Share Cradle for 1 x TC70 and 1 x Spare Battery. Requires Power supply (Part# PWRS-14000-148R) and AC Line Cord (Part# 23844-00-00R). The Motorola CRD-TC7X-SE2EU1-01 is also known as MOT-CRDTC7XSE2EU101	or CRDTC7XSE2EU101	.